Amounts that are distributed from tax-exempt sources, such as workers’ compensation and Department of Veterans Affairs payment, don’t need to be reported. Also, if part of a distribution is taxable and part is nontaxable, the entire distribution should be reported. Applicable businesses: Any organization that manages retirement plans and made designated distributions of $10 or more. 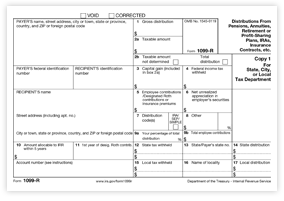 When to file: 1099-R forms must be mailed to recipients by January 31, and e-filed with the IRS by March 31 each year.